In this spy thriller, a CIA agent works to undermine terrorist threats to America. One of her main problems is a former military man whom she suspects of being an enemy agent. As the series progresses, the threats become more complex and hard to sort out. In the season finale, things begin to fall into place. Carrie and Quinn find out something while Keane makes a choice and Max finds trouble. Carrie and Saul submit evidence to Keane. Quinn trails a mark. Carrie receives bad news. Saul comes up with a plan. Quinn accepts his circumstance. Carrie pursues a lead. Saul catches up with an old friend. Keane takes a stance. Carrie manages her client. Saul's journey takes a turn. Quinn examines. Saul visits Abu Dhabi. Carrie delivers bad news. Quinn senses something. Carrie and Reda battle for their client while Quinn resists his new life. Saul and Dar think Keane has a secret. Carrie comes back to the US. Quinn deals with issues in this season opener. For one cast member, this season was the final one. Bizarre real life has influenced the show's season. Four seasons in, it's still the same ol' Carrie. The first-look trailer for "Homeland" season 4 is out, and it's definitely intense. Carrie Mathison (Claire Danes) looks to have already given birth to her baby, but exactly where the baby is, we're not sure...because she sure as heck isn't going with Carrie to Pakistan. Most of the action of the trailer follows Carrie around Pakistan, a departure from her plan to set up shop in Istanbul as the CIA station chief there. This episode of Homeland opens with Saul trying to get back to the United States with the sensitive information he uncovered at the end of last episode. The episode was another action packed eepisode adding more twists to the already pretzel shaped plot. The new trailer for "Homeland" season two is out, and it seems awfully similar to the trailer for "The Social Network." That's because it features the same choir that did that awesome cover of "Creep." 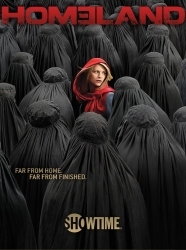 Homeland is currently available to watch and stream on Showtime. You can also buy, rent Homeland on demand at Showtime, Amazon Prime, Amazon, Hulu, FuboTV, DIRECTV NOW, iTunes, Showtime Anytime online.